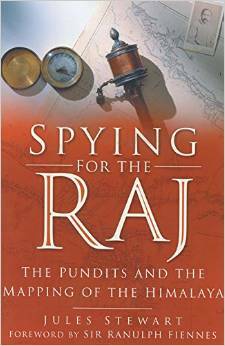 London-based journalist and author Jules Stewart’s second book titled, Spying For The Raj: The Pundits And The Mapping of the Himalayas was released in 2006. Sir Ranulph Fiennes, who is listed as the world’s greatest living explorer by the Guinness Book of Records, has written the forward for the book. I caught up with Stewart in London in 2006 just before his book was launched. We spoke about the book, and why and how this difficult task of mapping the Himalayas was undertaken by the British. What were the geopolitical reasons that propelled the British to undertake this trans-himalayan survey? The 19th is generally regarded as the “Golden Age” of geographical surveys, and some of the most important ones took place in India, which was mostly under British rule at that time. This fascinating book traces a 30-year (1864-1894) effort that was led by British Captain Thomas Montgomerie of Bengal Engineers to map the Himalayas stretching from Kashmir in the north to all the way in the East to Darjeeling area.The official name of the project was The Great Trignometrical Survey of India. The trans-himalayan region was an unknown territory and the British had huge gaps in their knowledge about the contours of the mountain range, Tibet, and the rivers that originated in Mount Kailash. Captain Montgomerie recruited local people from various regions of the Himalayas, trained them and established standardized ways of measuring their steps. Their step was the basis of calculation and it was important they got that right. This was a secret, covert operation that used all sorts of creative ruses and devices to measure this unchartered territory. The goal of this small group was to execute their tasks, but stay below the radar and not get caught. The recruits were not pundits by caste, but were a small group of eclectic group who came from the Himalayan region. There was Kinthup, the Tibetan tailor’s assistant from Darjeeling, and then there was Nain Singh Rawat and his cousin Mani Singh from the Kumaon region (now part of Uttarakhand State) among others. Singh came from Pithoragarh district that is on the border of India, Tibet and Nepal. A major geopolitical reason that propelled the British to undertake the survey was Russia’s ambitions in the Northwest frontier region of British Indian. The Russian search for a warm water port led them to this part of the world, and the British wanted to contain the Russian threat. In order to do that they needed to have a better idea of the terrain of the trans-himalayan region for military planning and logistics purposes. This was the Great Game of the 19th century, when the Russians were almost at the gates of India says Jules. Stewart suspects that Rudyard Kipling’s novel Kim had quite a few characters drawn from the survey. He thinks that Colonel Creighton in Kim was modeled after Captain Montgomerie. Stewart is a journalist based in London. In 2005 he wrote his first book called The Khyber Rifles. President Musharraf of Pakistan arranged for Jules to tour the Northwest frontier area. Stewart is already busy putting the finishing touches for his third book, which is a history of the Northwest frontier province. He is already thinking about his fourth book and is interested in writing about the Siachen glacier conflict. This interview was originally recorded in May 2006 in London.